Semi back-packing trip to South Korea with 3 girlfriends.. 6 months planning and finally it went through and yes, it was an awesome holiday this year! Depart KLIA2 via Air Asia to Incheon at 8:00am flight. We arrived at Incheon around 3:30pm. After immigration and luggage pick-up, went straight to buy T-Money and local sim card. Bought wrong sim card (my phone was with micro sim) and luckily the cashier was so helpful and accepted return goods although I have to top-up another KRW10,000 for the micro sim package of 1GB. I used SKRoaming package. Then bought T-Money and upload KRW20,000. Without the help of my frequent SK traveller’s friends, I would be lost. 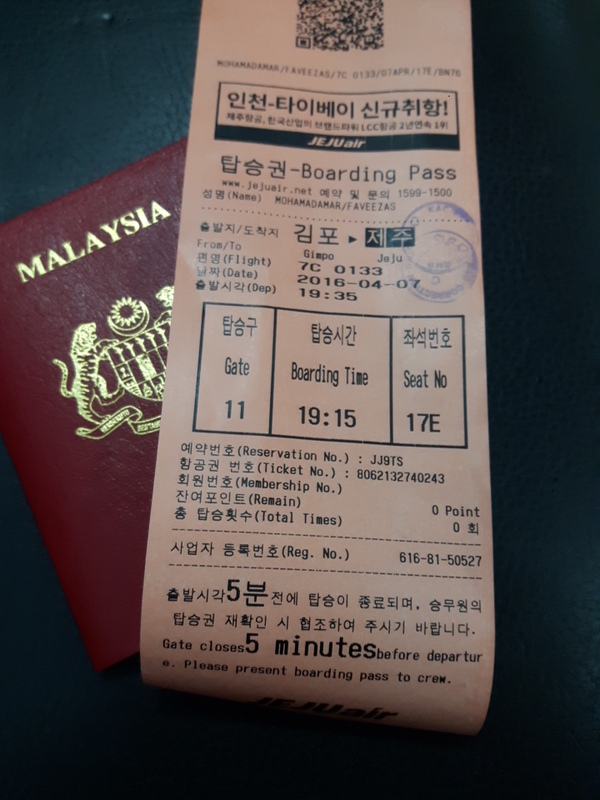 Went off to AREX line to go to Gimpo airport ~ plane to Jeju Island via Jeju Air at 7:35pm, about 1-hour journey. Arrived in Jeju Airport at 9:30pm. We rented a car at ‘Hertz rent-a-car’. There’s an airport coach on standby at arrival to ferry us to their office to collect our car. Rented a KIA Morning car for 6 days, totaled KRW192,100, shared cost and just nice for 4 ladies. 2 friends applied for the international license before our holiday. Staff showed how to use the GPS and some basic road safety in Jeju. Then off we go to our Guesthouse via GPS. Yayyy.. Arrived Lyndon Guesthouse almost to 11pm. The building is only up to 8th floor and our Guesthouse is on 6th Floor. Fortunately there was elevator, and all of us really tired from a long journey. We booked one room with 4 bunk-beds and personal toilet. It’s a nice room although a bit cramp for 4 people. We went back to our guesthouse around 9pm, bought some instant rice from convenient shop. Dinner: home-cooked kimchi fried rice, fried eggs, with canned chicken curry and fried fish in soya sauce (bought from home). 2 of our friends fly-off to Busan for a concert that evening so just me and another friend to continue our adventure in Jeju. PLAY KPOP Digital Park – A venue that displaying the history of K-pop in South Korea, from 80s till 2016 with the latest technology and the tour ends with final showcase of 3D hologram mini concert of selected K-pop singers/groups, we selected to watch GDragon hologram concert. Entrance fee: KRW30,000 per pax. Teddy Bear Museum – All sort of teddy bears from around the world, the most expensive teddy bear, the first teddy bear, the ugliest, celebrities resemblances, etc. Entrance fee: KRW7,000 per pax. Sanbangsan Mountain – We thought it was a field of canola blossom park but we were wrong. It’s actually famous Buddha temple within the mountain. We stopped by for about 5 minutes for some pictures and off to Monsant Café in Aewol district, further north of Jeju Island. We found a quite big field of canola flowers at the foot of the mountain and had to pay KRW2,000 to take some pictures. Worth it. Monsant Café Aewol – Spent the whole afternoon with coffee and nice view of the sea. Café is owned by one of famous K-pop singer, GDragon of Big Bang group. Café was full with local and tourists at all time and had to wait to a bit for empty seats. Back at guesthouse around 8pm due to long journey from the café. Same dinner as on first night but not complaining because the kimchi was so delicious. I guess something about eating dinner on cold night and hot & spicy food. Pure delicious. Jeju Cherry Blossom Festival – The festival is at the entrance of Jeju National University. We were hoping to see a whole street with beautiful cherry blossom trees but unfortunately our timing was wrong. It’s the end of cherry blossom season and we only got to see a few trees with almost withered cherry blossom. Met some uni students who were more excited to see us when we said we are from Malaysia. They thought we were students at first haha.. Flight to Busan at 11am so while waiting, we roamed around the shops in the airport and buy some small gift items. I come to love Jeju Island. The island was so beautiful and the people were nice. Food we tried on the street and restaurant were delicious, weather was awesome (well, if you come from hot climate like Malaysia haha) and all of us really enjoyed our holiday there. Would love to come again, but next time because there are so many places that I haven’t visited yet due to time constraint. If I will come again, I want to come during autumn or winter season. Next stop – Busan.